Welcome to our Munising Michigan Attractions - your choice for great Upper Michigan Attractions and Fun. Our Munising attractions includes a multitude of great places to see and experience. Come and experience the Pictured Rocks National Lakeshore, Historical Lighthouses, Seventeen Munising Area Waterfalls, and Grand Island. 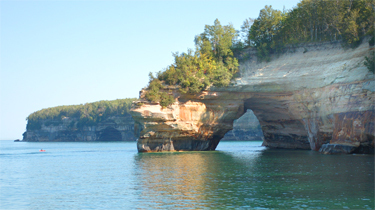 Our featured Munising attraction is the Pictured Rocks National Lakeshore! The Beach Inn Motel On Munising Bay is just minutes from the Pictured Rocks. Comprised of lime and sandstone, these cliffs tower up to 200 feet above the lakeshore. These cliffs of limestone exist today because of the lime/sand stone named the Munising Formation. Because of this formation, there are also many waterfalls throughout the Alger County area and beyond. Visitors to the Munising area can enjoy over 73,000 acres of Lake Superior shoreline along with our great surrounding National Park. The park also offers over 100 miles of trails to hike and explore. Pets are permitted only on specific trails - please check with the park service for more information. Click here for Day Hike information. The Pictured Rocks National Lakeshore are unlike any other place on earth. These pristine cliffs stretch for 15 miles along Lake Superior, from Sand Point to just beyond Spray Falls where the land changes to white sands and twelve miles of beach. Visitors will also enjoy the many rock formations, Natural archways, waterfalls, and sand dunes within the park. One of the most recognizable formations within the Pictured Rocks National Lakeshore is Miner's Castle (photo on right). In April 2006, on of the turret collapse due to erosion. Our area offers many ways to experience this top Upper Michigan attraction. 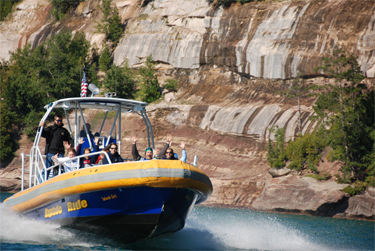 The Munising Michigan Pictured Rocks Cruises invites you to come & explore the Pictured Rocks National Lakeshore from the comfort of our tour boats. The views are breathtaking, up close and wonderful. Sandstone cliffs, beaches, sand dunes, & waterfalls along the Lake Superior Shoreline will delight viewers of all ages. Your journey begins in Munising located in the beautiful Upper Michigan! The Pictured Rocks Cruises, Inc. were honored with receiving "Michigan's Best Treasure Awards" in 2002! 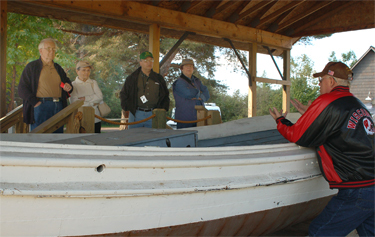 Located on picturesque Munising Bay in Munising, Michigan Shipwreck Tours offers modern travelers a chance to see the proud boats which sailed the Great Lakes before the turn of the century. Come Aboard! Discover the shipwrecks of the Alger Underwater Preserve through the clear waters of Lake Superior and view the rock formations of Grand Island. History comes alive as you hear about these turn of the century wrecks. This is the only place in the United States that you can see real shipwrecks aboard a Glass Bottom Boat. Munising MI has a new tour called Riptide Ride, offering amazing views and ultimate fun. Experience the excitement of riding on a Navy Seal vessel! Feel the breeze and hear the waves. The Riptide Ride combines the ultimate package of fun and beautiful scenery. Depending on how much time you would like to spend on the water, Riptide Ride offers two trips: Rip Around The Bay, is a 30 minute ride and the Grand Island 360 is 1½ hours long. Munising Michigan has an astounding seventeen area waterfalls to discover, photograph and enjoy. They are located in almost every direction of Munising, along with right in town. Munising Falls: located in Munising in the western most portion of the Pictured Rocks off of H-58 (watch for signs) turn on Sand Point Rd. Laughing Whitefish Falls: located in western Alger County, 8 miles (13 km) south of Lake Superior near M-94. Miner's Falls: located five miles north of Alger County Road H-58 off Miner's Castle Road. There is a 1.2 miles (round trip) high to the viewing area. Mosquito Falls: located 15 miles east of Munising on CR H-58, then 5 miles north to the parking area. Chapel Falls: 15 miles east of Munising on CR H-58, the 5 miles north till you get to the end of Chapel Road. There is a longer hike of 1.5 miles to walk to viewing area. AuTrain Falls: north of M94 east of Chatam and south west of Munising. 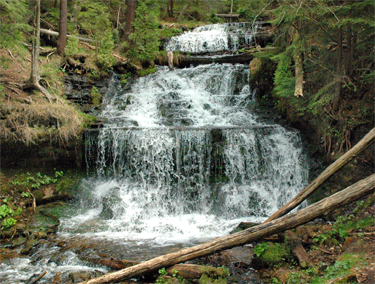 Tannery Falls: head East on H-58 / Munising Ave, aprox 1.25 miles and follow the signs. Horseshoe Falls: located in the Southeast portion of Munising Michigan. 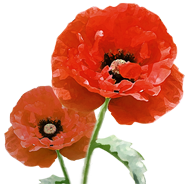 It is a privately run tourist attraction with a small admission fee for visitors. Memorial Falls: located on H-58. Just head East on Munising Ave, turn right on Nestor and follow the signs. 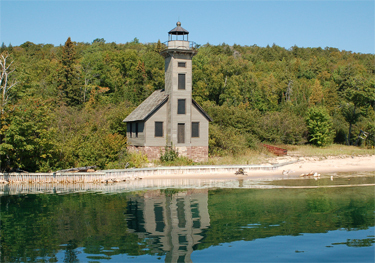 Munising offers a great selection of interesting, beautiful and historical lighthouses for viewing and photographing. Shown to the right is probably Munising's most famous - The East Channel Lighthouse located on the southeast shore of Grand Island. No longer in service, the Munising Range Lights now navigate the ships through the channel. Constructed of wood, the lighthouse first opened in 1868. It is part of a listing on the National Register of Historic Places, Reference #80004835. Best viewed by boat. Munising Range Lights (2) - one on the hill of Munising & one downtown. Filled with history and lore, the Grand Island National Recreational Area of Munising Michigan offers a host of activities for the adventurous visitor. 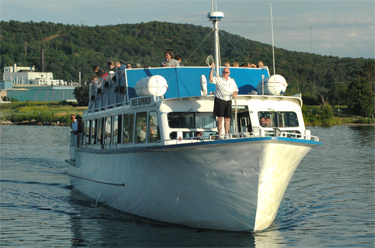 Grand Island is situated in Lake Superior and offers bus tours, biking, and hiking. Rustic camping is also available on Grand Island. 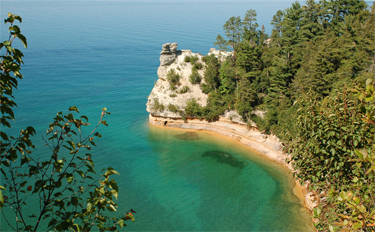 This great island offers spectacular long distance views of the Pictured Rocks. 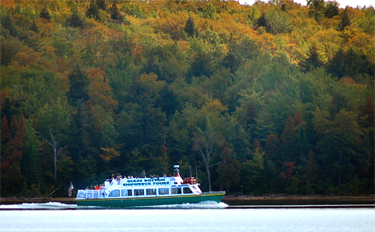 Grand Island Bus Tours are a great way to see the Island without pedalling or walking. Frequent stops let the guest stretch their legs and walk to nearby spots of historic importance. Here our guide is introducing the Island and talking about some of the history we will discover later in the trip. With two lakes, many historical buildings, artesian springs, trails, a cemetery, the largest social lake in the U.S., cliffs over 300' above Lake Superior, camping, hiking, biking, exploring - you are visiting an Island of Adventure! You'll have to take the tour to learn about the stories, novels, Native American tales, the mysteries, and more! With over 800,000 acres to explore, the Hiawatha National Forest is a wilderness of opportunity. It is located in the eastern and central Upper Peninsula. It has over 800 miles of streams - many with trout, more than 280 lakes, and over 77 miles of Great Lakes Shoreline. Visit their link to learn more. The Seney National Wildlife Refuge was established in 1935 and covers more than 95,000 acres. Birds, deer, moose, eagles, sandhill cranes, swans, loons, ducks, and more will amaze viewers as they hike, bike, walk, drive, or canoe through the refuge. You can explore the refuge in many different ways: drive your vehicle, biking, walking, canoeing, kayaking, snowshoeing, and cross-country skiing. Plan a kayaking or canoeing trip on the Manistique River - drift quietly through the Seney Refuge. This is a great opportunity to see wildlife! Enjoy breathtaking views of the wilderness and wildlife when you visit this unique habitat.